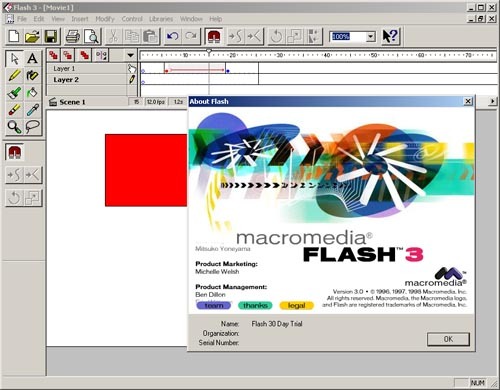 Back in 1997, I started using Flash 2. It was after seeing Nagafuji Kanwa’s Image Dive Studios website. Those were the days when transparency was the big new feature in Flash 3. Wow. I managed to snoop through age old and fortunately rarely updated download websites. I found trial versions of Flash 1, 2, 3 and 4 . These screenshots are free to use under a Creative Commons Attribution-Share Alike 3.0 Unported License. 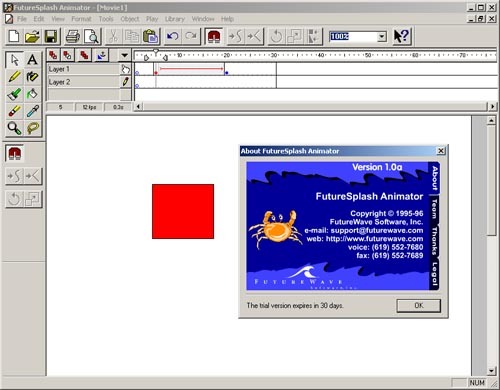 Flash 1, or Futuresplash as it was called, was a GIF animation program for web advertisements. It also allowed you to export to an intriguing format, .SPL—a vectorized animation format that required a plugin. 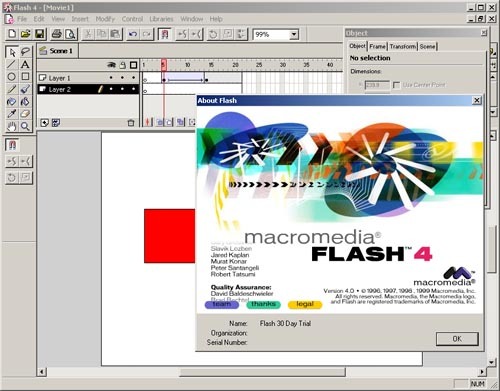 Macromedia, then known mainly for it’s Director, SoundEdit, Fontographer, X-res (Photoshop clone) and Authorware programs, saw possibilities in Futuresplash and bought the company. 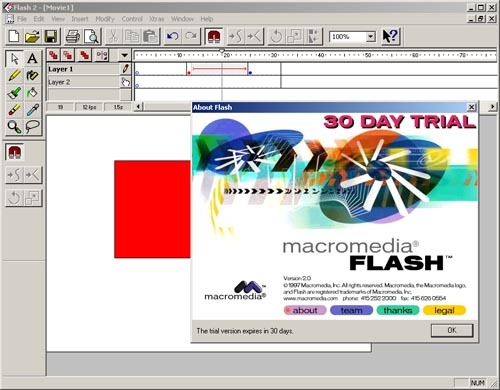 Even today, www.futurewave.com redirects to Macromedia’s Flash product page. Futuresplash, renamed Flash 2, got shortcut keys and a new logo designed by Hillman Curtis if memory serves Neville Brody (Thanks kemie)! The .SPL vectorized format was renamed .SWF, “Shockwave Flash”, and the plugin got a neat link button. Flash was truly born. Flash 3 was an awesome update. Oh man. I still remember how many new possibilities I got with the new transparency feature. One of my first websites, was built in Flash 3. Among the new features, was also Shape Tweening, Tell Target, and Aftershock, a seperate application to generate HTML code for your SWF files. Flash also got Generator, a ridiculously pricey server-side application that would serve dynamic sound, video and text. Flash 4 had mainstream hit potential. A buckload of new “Actions” were added, such as variables, object properties, and much more. The program could now be used for serious purposes, and it was a golden-age for Flash websites. Among the features added in Flash 4, was also MP3 compression, a redesigned timeline, the ability to load data from external sources, and an annoying tabbed palette with rarely used features. Generator also got an update, to Generator 2. Today, Flash is version 7, or MX 2004 as they would have you call it. The “golden-age” is over, and web standards and usability seem to be in focus. I think it all comes down to one word: purpose. Flash is great for video, animation and sound. It is not for websites… atleast not mainstream websites. It’ll be interesting to see what new features Flash 8 will have, but I think it’s future will be defined by it’s persisting purpose.